The Asian Leopard Cat has large round eyes. I selectively choose kittens that have these eyes to keep for my program. 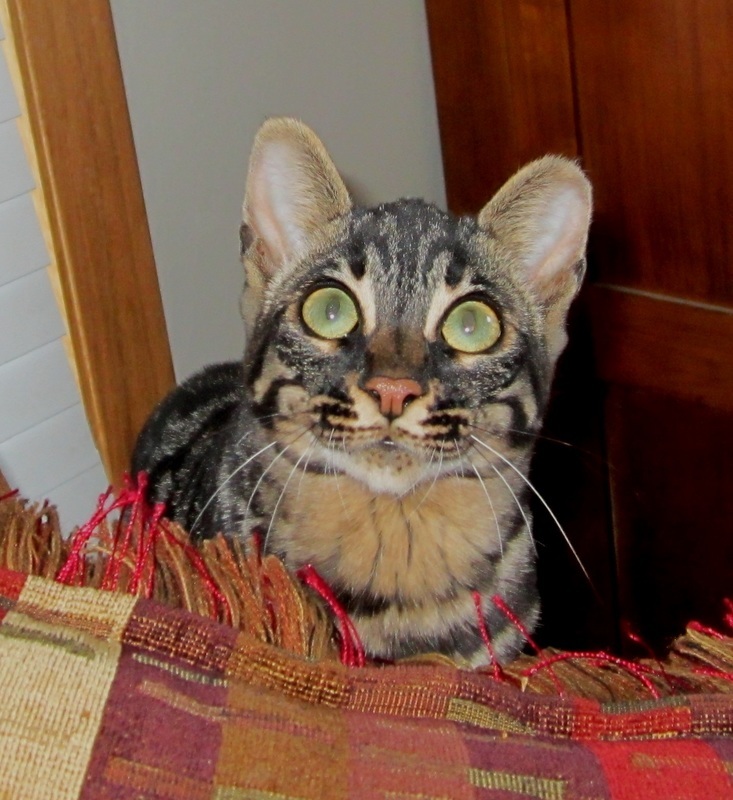 Below are Asian Leopard Cat eyes. Below are Bengal Cat eyes. 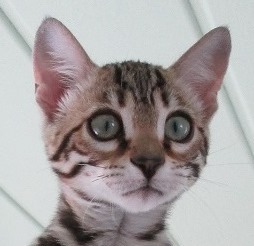 After over a decade of breeding bengals, I would have to say that the ears are the hardest trait to improve on. The Asian leopard cat has small rounded ears. Acquiring these small rounded ears is the goal of most breeders, however, because larger pointed ears appear to be dominant it has been a trait many breeders stopped focusing on. Most F1 kittens do have rounded ears but getting them onto F2, F3....SBT has been an extreme challenge. Below are some pictures of Kili who is a Brown Spotted F2 with very round small ears. Unfortunately, because early generation males are sterile, he was not able to contribute to improving this breed. 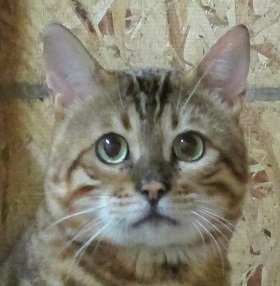 You will also see pictures of Omega, another F2 girl, and a brown spotted F2 male kitten. Developing ears like this takes many breedings to determine which two cats will keep the ears and which ones will not. The size of a mates ears do not always determine the size of the kittens because a pairing doesn't just bring the genetics of two cats together, but instead, brings two complete pedigrees together. I have these ears in my F2's (although not all of them) and I will continue to work towards my goal of having rounded ears in my SBT's. Like many of the traits, the tails on Bengal cats can also vary. There are spotted tails, striped tails, and mixes of stripes and spots. There are skinny long tails and short fat ones. Each breeder will produce a different look depending on the genetics they are working with. 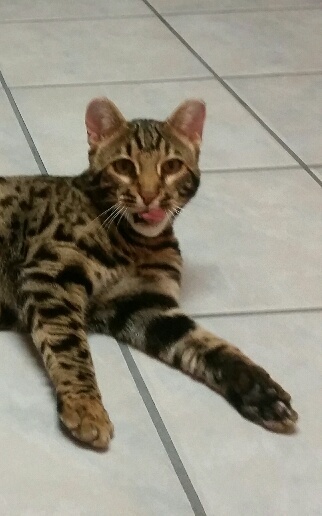 I have read many times online that the goal is to breed a Bengal with a "Short Fat Tail like the Asian Leopard Cat. " After owning two ALC's I believe this statement is incorrect. Although the ALC has a thick tail with a rounded tip, it is my no means "short". Since my goal is to produce traits that are as close to the ALC as possible, I select for thick tails with rounded tips. Below are some tail examples and my description of them will be next to each picture.